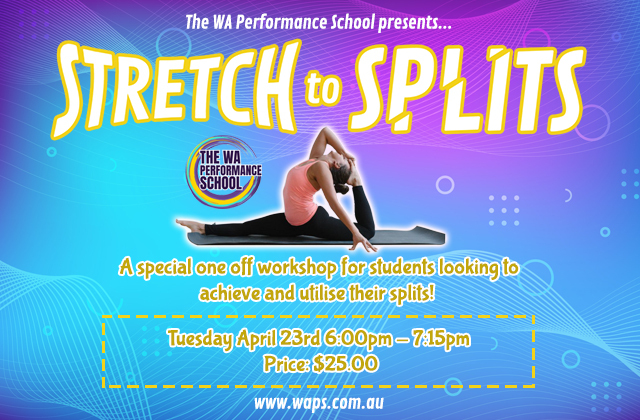 This is a special one off workshop for students looking to achieve and utilize their splits! In this fun workshop you will be working on left, right, and middle splits, including fun variations and new ways to use them. You will learn correct warm up technique, specialized stretches for your hamstrings and hip flexors, how to get deeper into your splits and comfortably start to stretch to over-splits! Included in your workshop price is the use of our yoga mats, and special stretching materials (such as blocks, bands, and rollers). Open to all, whether you are a WAPS student or have never even danced before! THREE – Breathe! A lot of the time we see students hold their breathe whilst they are stretching, which actually tends to lead to tensing muscles which does not help your splits. Remember to relax and breathe deeply and slowly when you stretch! FOUR – Be Strong! Look for workouts and classes that can help to improve your strength conditioning as well. In order to improve your extension strength is key to HOLD your limbs in place. The flexibility will get you there into the shape, but we also want to be able to do things once we reach our splits, and that is where strength comes into play. Adult students who want to extend their flexibility and achieve their splits, join us in our STRETCH TO SPLITS workshop to put these tips into action! Places are limited, book today! Email dance@waps.com.au or call (08) 9388 6970. All payments due one week prior to workshop in order to book.